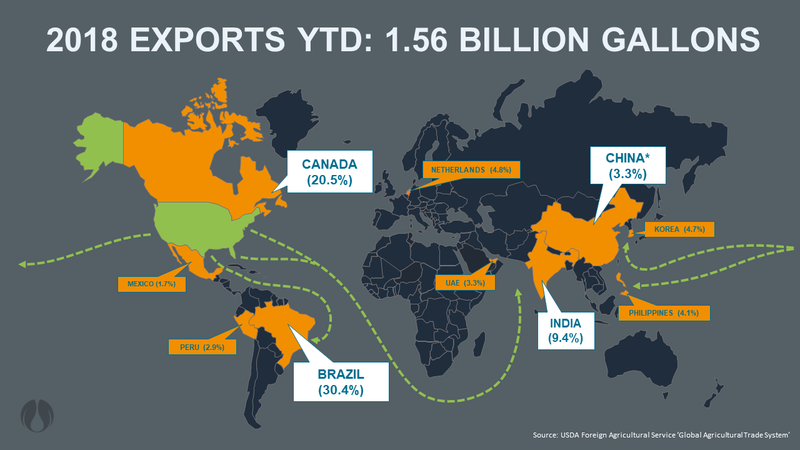 As we await the final USDA Foreign Agricultural Service reports for ethanol export numbers for 2018, it was no surprise that November continued the trend of unprecedented growth in exports with over 1.56 billion gallons reported year-to-date and over 147 million gallons for the month. On a 12-month rolling basis, we have seen numbers also continue to grow reaching a record 1.73 billion gallons. Despite the United States suffering from continued trade setbacks, the steady rise in multiple export markets has offered critical consistency for American producers. Canada’s commitment to biofuels, both at the provincial and national level, continues to remain strong – at over 28.3 million gallons in imports for November. As we recently discussed, Ontario’s Environmental Plan will expand biofuels blending requirements to 15 percent by 2025 for the province. More recently, we have also seen Canada continue to move towards reducing the carbon intensity of their fuel stream at the national level, and Growth Energy has remained engaged in the conversation with our allies in the country to ensure they can take advantage of biofuels to reach their climate goals. The resurgence of ethanol imports in Brazil has also continued from October through November and should remain strong through the end of the year. In November, we saw an impressive 51.2 million gallons exported to the country, as the end of their sugarcane harvest signaled a need for ethanol imports to meet demand. Brazil continues to hold the crown as the top export destination for 2018, representing 475.8 million gallons, nearly a third of total exports for the U.S. However, due to their domestic production, the country offers far less consistency for American producers on a month-to-month basis. As we begin to consider how the global ethanol outlook will develop in 2019, one country to keep an eye on will be Colombia. In 2018 so far, they have imported over 43 million gallons making them an important and growing export destination. It is important for the ethanol industry to support burgeoning markets that are embracing ethanol for its environmental and economic benefits. And Colombia’s domestic ethanol production has begun to ramp up as they adjust to their new 10 percent national mandate from March of 2018. It is key that Growth Energy and American producers remain engaged with countries like Colombia to ensure open and reciprocal markets that will help them meet their climate goals. As we plan for 2019, that engagement will be critical to continuing to build on the impressive growth of biofuels around the globe. Trade barriers only restrict nations’ ability to reach their climate goals and take advantage of the economic and environmental benefits of ethanol blended fuel, and what our farmers and producers rely on is stability. While countries like Canada and Brazil have offered consistent markets for American producers, there is untapped potential around the globe that would benefit from improved trade relations and removing barriers to trade. Stay tuned for next month’s 2018 wrap-up and some of the key takeaways for the year.